The ceilings and walls inside the Qatar National Convention Centre (QNCC) are clad with 6,000m² of architectural wire mesh made by Haver & Boecker, in order to improve the acoustics. To meet the exclusive requirements of the room´s ambience, the designers chose bronze and stainless-steel wire mesh. The high-quality aesthetic of the architectural mesh, as well as the excellent long-life properties, non-flammability, easy maintenance and recyclability, made choosing Haver & Boecker wire mesh an easy decision for the client. Located in the Education City of Doha, the QNCC is the first of its kind to be built to gold certification of the US Green Building Council´s Leadership in Energy and Environment Design (LEED). 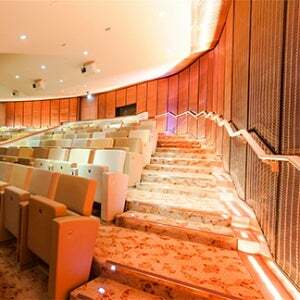 The walls of the theatre hall are clad with bronze wire-mesh type MULTI-BARRETTE 8123, which underlines the exclusivity of the ambience due it´s colour. The elegance of the wire mesh allows interaction with various light reflections, giving it a unique aesthetic. The wire mesh was specifically designed for the acoustic requirements of the theatre. It is coated with clear varnish, canted to the edges and glued into black-coated aluminium frames. Due to their structure, the wire mesh types combine air permeability and acoustic neutrality with an optically closed and homogeneous overall picture. So as not to affect the appearance of the decorative wire mesh claddings, Haver & Boecker developed a special invisible fastening system whereby the cassette elements remain removable.